GLOBAL WARMING has become GLOBAL WEIRDING (Climate Change). 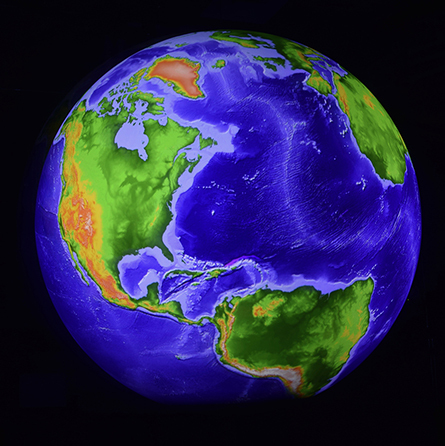 A 30 minute presentation on Global Warming and Climate Change will be given at the Science on a Sphere (SOS) Center, Room 803 at the Santa Fe Community College. Presenting will be Dr. Edwin Barker, retired NASA scientist and Chair of the SOS Advisory Committee, and Rev. Dr. Dave Wasserman, honorably retired Presbyterian Church and author of Riding the Blue Marble (2018). The presentation will review the basic concepts of weather, climate, earth’s natural balancing systems, the impact of CO2’s heat-trapping blanket, and how to look for the silver buckshot of hope. Participants will be invited to participate in a follow up World Climate Simulation Game (MIT University) modeled on a UN session negotiating CO2 reductions. Room 803 is in the Trades and Technology section of the college. From the eastside main parking lot, look for a green colored section of the building (Room 803). Enter the Trades and Technology main door, turn left. For more information on these presentations, contact Ed Barker (ebarker40@comcast.net) or Dave Wasserman (davewass1948@gmail.com). Check out the SOS webpage.